You’ve probably seen the work we’ve been doing with Nottingham property letting agents, Eastside Properties over the last couple of months including their brochures, exhibition stands and folders, so it wasn’t a surprise when they asked us to take a look at revamping their website. The site looked ok as it was but it was down to the team at Fifteen Design to give it a good spring clean and sprinkle that bit of magic in a few places. 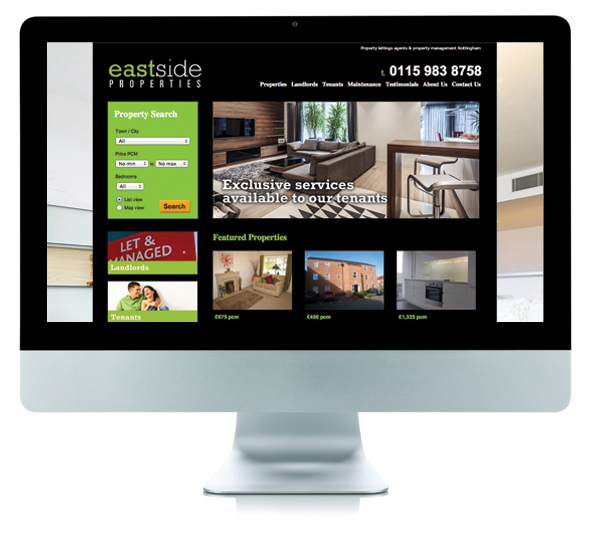 We updated the site to make sure that it was ‘on-brand’ throughout and added a cool new background image to ensure that the site really represented the quality service that Eastside offer their clients. The site is now really easy to navigate and its really easy to find that perfect property with the search facility and several more new featured properties added onto the homepage. We’re really pleased with the project and there is several even more exciting things to come so watch this space!